The history of Cadillac’s CTS and its role within General Motors, as well as the rebirth of true American luxury cars, can’t really be understated. That makes it one of the most important American cars on the road today—and certainly one of the most important for Cadillac. Fortunately, the latest model is another home run. With the arrival of the new Cadillac ATS, the CTS has been freed to grow larger, finally competing on even terms with the BMW 5-Series, Audi A6, and Mercedes-Benz E Class. That’s a good thing, because it means fewer compromises, but it’s also tricky for Cadillac, as it permits fewer excuses. On the styling front, the latest CTS has moved farther away from Cadillac’s once-dominant Art & Science theme, softening edges and blending curves in a more elegant, modern manner. The result, to many eyes, is a marked resemblance to the latest E Class, particularly near the C pillar, as the roof bends down to meet the trunk lid, as well as in the shape of the side glazing. New LED strips along the headlights visually pull the nose lower to the ground, while simultaneously sweeping up into the front fenders; the 2014 CTS manages to look larger, yet lower, and sleeker, than its predecessor. Inside, the look and feel has also been raised to a new level, with a single-piece dash cap draping the center stack, stunning wood trim, cut-and-sew upholstery, and the CUE-centric front row all working to deliver a high-tech, luxurious look—at least on the upper-tier models. Three powertrain options give the CTS a flexibility and range that matches, and, in some cases, exceeds that of its German counterparts. At the entry position sits a four-cylinder turbocharged mighty-mite, rated at 272 horsepower, and paired with a six-speed automatic transmission. Rear-wheel drive is standard, with all-wheel drive available. Electric power steering gives a light touch, if less than dynamic steering feel, but overall, the base CTS feels well-sorted—though some may find the four-cylinder to be a bit harsher and noisier than those from the competition. At the mid-range you’ll find a 3.6-liter V-6 sporting 321 horsepower and 275 pound-feet of torque. An eight-speed automatic transmission is standard in rear-drive models, while all-wheel drive versions use a six-speed auto. Capable of scrambling the CTS to 60 mph in about six seconds, the V-6 feels much more at home in the sedan, and suits its character more easily. 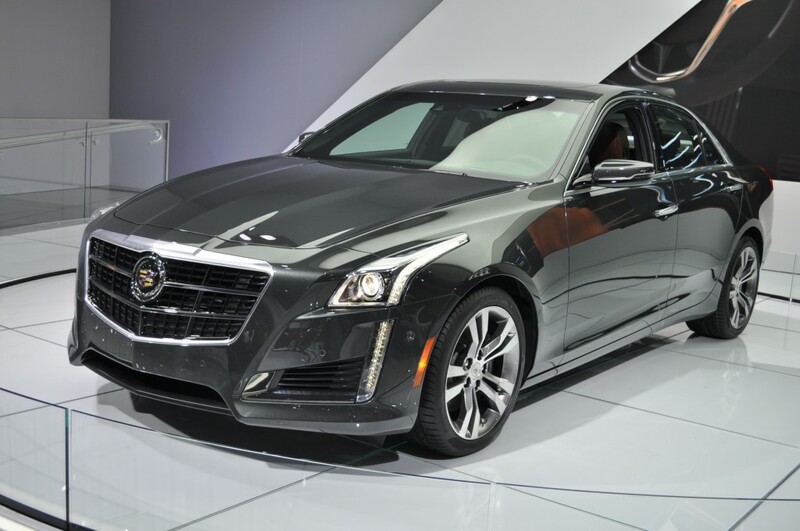 Topping the 2014 Cadillac CTS range (so far) is the Vsport, packing a twin-turbocharged version of the 3.6-liter V-6 rated at 420 horsepower and 430 pound-feet of torque. Paired with the eight-speed transmission, the CTS Vsport is available with rear-wheel drive only, and it gets an upgraded suspension, grippier tires, Brembo brakes, and an electronic limited-slip differential to further boost its performance margin. Despite growing in size and complexity, as well as refinement and luxury, the 2014 CTS has managed to keep its weight in check; it’s about 250 pounds lighter than the previous CTS, and it’s among the lightest in its class, tipping the scales at about 3,616 pounds in base form. All versions reflect this weight savings, as well as the stiffer chassis of the 2014 model, in balanced, competent handling characteristics. The Vsport is the natural star of the CTS sport sedan show, its magnetic dampers (optional on all models) effortlessly merging comfort with sporty feel. Now 4.1 inches longer than before, riding on a 1.1-inch longer wheelbase, the 2014 Cadillac CTS is a true mid-size luxury sedan. Despite the other increases, the roofline of the new CTS is about an inch lower than before, lending the car its low, wide stance. Rear-seat space has grown, too, making it a more useful five-passenger vehicle, though still a bit tighter than its German rivals. The front seats are comfortable and supportive, with 14-way power adjustment available even on the base seats; upgrades offer 16-way and 20-way adjustment, plus manual bottom cushion and headrest adjustments. Throughout the new CTS, there’s a feel of quality material and well-built structures, though the overall effect tends toward the more glam side of the visual spectrum; there’s no Teutonic restraint exercised here. Quietness and comfort is generally very good, thanks in part to GM’s active noise cancellation system for the turbocharged models. A number of high-tech safety features have made their way into the CTS as well, though they were launched on the XTS and ATS. Haptic feedback directly to the driver’s seat alerts you to lane-keeping deviations, relating the vibration of the cushion to the side of the impending lane transgression. Other safety features include: 10 airbags; parking sensors; rear-view cameras; a combination of radar and cameras that offer forward collision alert; adaptive cruise control; cross-traffic alerts; and more. GM’s OnStar system is also included, with a free year of service, offering location-based services, emergency assistance, and smartphone app access, as well as other functions. Even in base form, the 2014 CTS is well-equipped. Three trim lines offer paths and packages for improving on the standard mix: Luxury, Performance, and Premium. All models include power windows/doors/locks, cruise control, climate control, and Bluetooth with streaming audio. The CUE infotainment system is available, pairing capacitive touch-sensor controls with a touchscreen and haptic feedback, as well as voice-recognition capabilities. While the latest updates to the CUE software have improved its response time and overall ease of use, the natural language voice recognition system has still left us cold—and often reaching for our smartphones for on-the-go voice search. Still, with its large and high-resolution 8.0-inch screen handling navigation, audio, climate, and phone functions, as well as information relayed to the instrument-panel LCD screen, and additional steering-wheel control buttons, the CUE system is full-featured and highly usable. Other available upgrades for the 2014 Cadillac CTS include parking assist, which can take the wheel to perform parallel parking maneuvers, leaving the driver to control the pedals; a Bose audio system; ambient LED lighting; a cupholder with a power-operated cover; and more.